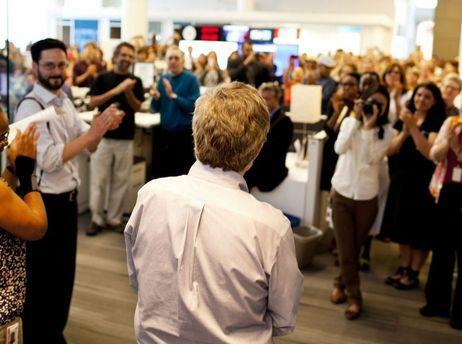 Neal Conan leaves the studio to an ovation from NPR staff members. "Love To The Point, good choice to replace TOTN. I am still fuming over the cancellation of TOTN. There really is nothing like it on radio. I do not find locally produced programs with the variety that there was on TOTN." NPR Ombudsman Edward Schumacher-Matos has an excellent post full of listener comments from across the country. We at KGOU have discussed the decision with NPR, and if you have strong feelings either way, we urge you to contact NPR as well. "Thank you, thank you for honest, intelligent, well spoken reporting!! You save me every day!" The Oklahoma network of public broadcasting professionals set the example for all of us regarding service to the community during and following a crisis. KGOU exemplified courage, passion and endurance by serving the state of Oklahoma and the nation at large with accurate, up-to-date reporting. KGOU, KOSU and NPR demonstrated how well local and national journalists collaborate. Your station made a difference last week and you set the bar higher for all of us in public broadcasting. I thank you for your leadership and for all the inspiring work you do." Please keep the comments coming. Your words inspire and challenge us to do our best every day, to overcome whatever daily, monthly or perennial obstacle we face. Your emails, notes and letters remind us who we're doing all this work for, and with, and why we are striving to make a difference. Thanks for writing. This week is finally here. This is the last week of NPR’s program, Talk of the Nation, and we are sad to see it go. Our best wishes to Neal Conan, and we hope to hear from him again. After 25 years at NPR, 11 of them hosting Talk of the Nation, Neal Conan has been one of NPR's most distinguished journalists. He brought extraordinary depth, insight and skill to his work. He will leave a legacy of excellence, having carried the nation through some of the most important news of the last decade.